Priscilla Gilman's story starts when she is a graduate student in English at Yale, working on her Ph.D. dissertation on Wordsworth. She was born in New York City, and her father, the critic Richard Gilman, had done some teaching at Yale. Her father was a complex man who from her brief account seemed to give a great deal emotionally, but also to demand a great deal. Her mother ran a literary agency. Her parents divorced when she was young. She had always interested in being a writer, but her parents encouraged her strongly to pursue a PhD. She had been engaged to a son of Mia Farrow and Andre Previn, although that had not worked out. She gives a picture of an intense and rather difficult childhood. She took time off when she was an undergraduate to read Proust in French and undergo psychoanalysis. When she started graduate school, she met her future husband, Richard. They soon started dating, brought together both by a love of their studies and a deep wish to have children. They soon married and in a few years Gilman was pregnant. Their son Benjamin was linguistically gifted, and Priscilla and Richard were thrilled about his talents. They noticed his differences but accepted them unconditionally. They were alarmed a few years later when a pre-school who interviewed him recommended that he be tested, and he was found to have hyperlexia. This is a rare condition that may be related to autism and while those with it have great facility with words, they have difficulty with understanding, communication, and social skills. The bulk of the memoir tells the story of how Gilman and her husband came to terms with the condition, searched to get the best treatment for Benj, celebrated his successes and changed their conceptions of what they wanted from their children. It is also the story of their marriage and eventual separation, her success as an academic and her subsequent choice to leave the academic life, and the evolving relationships between them and their family members. The book is distinctive in several ways. It's a memoir of being a parent of special-needs child, a growing genre. Most of the reviews at Amazon.com are from people approaching the book from this perspective. As such, it is an interesting account because of the unusual condition Benj has, and the ways that Gilman makes decisions about medication, schools, and home-life, especially because she and her husband separate and make special arrangements to as not to disrupt the lives of their two sons too much. It is more unusual in being an account by an academic of being in such a situation. It can be compared to English professor Michael Berube's 1996 memoir Life As We Know It, about learning to be a parent to Jamie, his son with Down syndrome. While Berube's memoir was mainly political and philosophical in its meanderings, Gilman is far more literary, and she refers to and quotes Wordsworth and other poets frequently. She characterizes Benj as the "anti-romantic child" because he is in most ways very far from the ideal of childhood found in the movement of Romanticism. Benj is a very literal child who does not engage in imaginary play, while the Romantics place imagination at the heart of life and prize it above all other qualities. They celebrated emotion and subjectivity, and in particular, Wordsworth celebrates the bond between mother and child and the carefree life of children investigating the world. Yet Gilman and her son did not have an easy relationship when he was a baby; she was alienated from him. As he grew, he continued to be different from other babies and toddlers, although things got easier in some ways, and more difficult in others. Gilman discusses her feelings about academic life and how her experience as a mother of Benj changed her feelings about jumping through the hoops required to succeed. Although she had tenure-track positions at Yale and then Vassar, and so had excellent students and very supportive departments, she was not able to spend her time focusing on the literature she loved, and she had to discuss the secondary literature. She eventually decided that she would be better off leaving academia and working in the publishing business, where she could earn more money. From the start of the story, she is subtly critical of her husband Richard, and she explains at length how long suffering she was in putting up with his problems in finishing his work. It is only through her that he got a job at the schools she taught, due to being her spouse. Indeed, although she hated to say it, Benj's problems are very similar to those of Richard's, and so the implication is that Benj inherited them from his father. It is fair enough for a memoir writer to give their side of the story of a failed marriage, but readers will wonder what version of events Richard would give, and how well they would match that of Gilman. It is also puzzling why Gilman left the activity of studying Wordsworth altogether in order to work in publishing and presumably to write her memoir. Would she have got tenure if she had stayed at Vassar? Only a few people would be in a position to say, and Gilman herself would not know for sure. But in her version of events, she is the hero of her story and she is in control of her destiny, although of course she has to change her vision of Benj's future from what she had envisaged when she had previously imagined her motherhood. The memoir is largely her account of how she came to accept this change in her life. That's not to say that the work is just an extension of Gilman's psychoanalysis, more about her than it is about anyone else. It is very much about Benj and how boys like him fit in the world. It is a defense of a Wordsworthian approach that is tolerant of difference and does not insist that all children be assessed by the same measures. It is a celebration of Benj's individuality, showing how the standard descriptions of hyperlexia fail to capture his strengths; one of the more moving parts of the book is the final section, which is a more abstract yet passionate discussion and criticism of some standard approaches to special education. She says that Benj has taught her a great deal about poetry, inspiration and the creative process; so her book is also about Wordsworth's central themes. While Gilman's account of her life may be more subjective than she herself suggests in her tone, this possibility does not undermine the book. 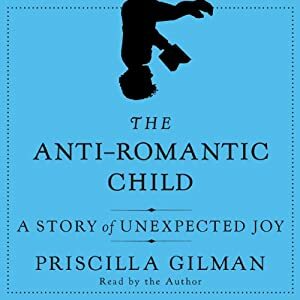 Indeed, The Anti-Romantic Child is one of the most thoughtful and powerful available accounts of being the parent of a child with developmental disabilities, and it deserves to be widely read for many years to come. It's a work of originality and inspiration that could help not only parents, but also teachers, clinicians, and policy-makers. Gilman herself reads the unabridged audiobook. The fact that it is the author reading makes a difference because her performance of Benj's voice carries authority, since she knows better than anyone how he speaks. One might suspect that the performance was overenthusiastic if she were not Benj's mother. The reading is warm and compassionate.